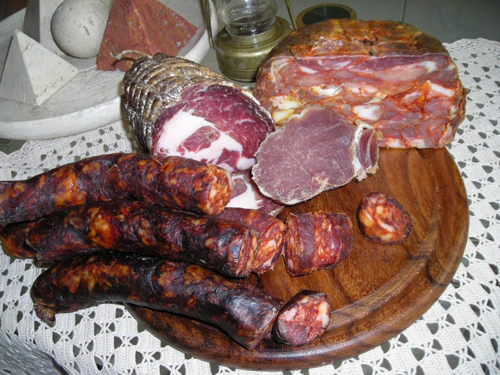 The Molise region is characterised by numerous kinds of cold meats, but the most representative is Ventricina. This cold meat is typical of the hilly area. 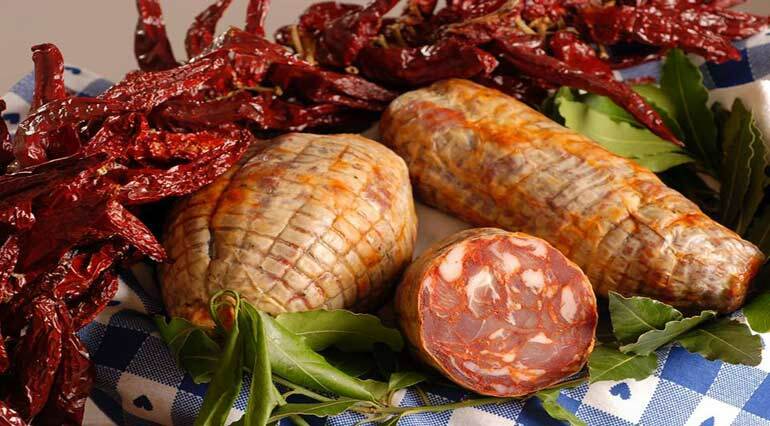 This special cold meat is still produced in limited quantity with a very traditional method, nevertheless, the name and the image of the product is being utilised by the Italian industry to enhance the gamma of products offered. Montenero Di Bisaccia is very well known for its Ventricina, located between San Salvo and Termoli. There you will find several savoury receipts cooked with Ventricina. Many people spread this delicacy on an open slice of bread. If desired the bread slices can be placed on the grill or in the oven for a period of time, thereby making a kind of bruschetta. • 30% underbelly and thigh fatty part. 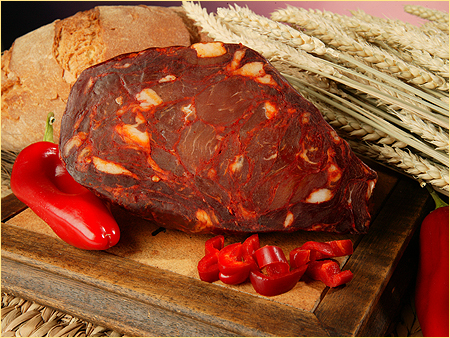 Frozen or preserved meat are strictly forbidden. The meats are spiced with: sweet and spicy peppers, fennel seeds and pepper. Meats have to be cut with a very sharp knife into cubic forms pieces not smaller than 2 cm. Meat mixing take place after the cut, all the ingredients have to be perfectly mixed. This process should be done quickly, because a prolongation of it can affect the fattiest parts. 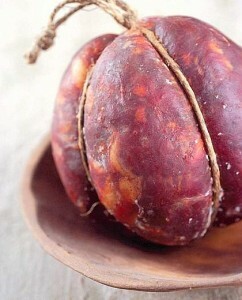 Once the ingredients are perfectly mixed with the meats, this mixture is inserted into a gut hose, previously washed in running water and then placed into a bowl with water, vinegar, orange peels, garlic and bay laurel’s and left to be deodorised. Once filled the gut has to be tied with a thick twine. Nets for food can be used too, instead than tying. Once tied, is necessary to riddle with holes the meat with a thin needle. Saturation and seasoning take place at temperatures not over 13° and for a period of time not inferior of 90 days. During the first days of seasoning the meats can stand higher temperatures up to 18° but in dry environments. The outside of the ventricina can be spread with lard to avoid the loss of wait after the fiftieth day of seasoning. Put the flour on a wood surface and mix it with the hot water. Mix the dough with your hands until reaching a soft and smooth consistence. Stretch pieces of pasta in the shape of strings with diameter of 1cm, then cut into pieces of 3-4cm and flour them, at this point dig them in the middle with two fingers. Finely chop onion, garlic, carrot and celery and brown them in a pan with olive oil. Cut ventricina into small pieces and put it into the pan with the vegetables. Add bay laurel leaves. Add tomato sauce and cover the pan. Cook over low fire for half an hour. Cook the pasta in boiling water, drain it and add the sauce.